As you prepare your facility for winter weather, you need to think beyond snow and ice. Some pests like rodents are actually more active in the winter months as they seek food, water and shelter indoors. Rats and mice aren’t hibernators, so they must continuously feed throughout the winter to keep warm. Food processing, handling and storage facilities have everything rodents need to survive. Unfortunately, rodents can cause serious problems for your business. Rats and mice pose a significant health risk, not only to your employees but also to your products. Rodents are known carriers of more than 35 diseases-causing pathogens, including the plague bacteria, salmonella and Hantavirus. Because they have tiny bladders, rodents expel urine and feces almost constantly, leaving a trail of these disease-spreading pathogens and contaminants throughout your facility that can contaminate your products, causing food poisoning and spoilage, which can lead to significant economic loss. Rodents also can physically damage your property as they gnaw and chew on building materials and electrical wiring. Gnaw marks on wiring, containers, insulation and wood pallets are a sure sign of rodent activity. Rodents’ teeth are always growing, so they gnaw on whatever they can to keep the teeth to proper size. Look for small chisel-like indentions on solid food, objects and structural surfaces. If your facility is having unexplained power issues, carefully inspect electrical wires to see if rodents have chewed through. If there are rodents in your facility, you may see their pellet-like droppings. Rodents produce an average of 80 droppings per day. Your pest control provider can use these droppings to determine the type of rodent, the size of the infestation and where in your facility they’re most active. Rats have great memories, and once they’ve found a safe route, they’ll never forget it. They travel the same stretch often leaving oily rub marks on walls and skirting boards. If the marks on the walls smear easily, they’re likely fresh. Rats and mice are most active after dark. If you see rodents during the day, this usually indicates a larger infestation. Staying ahead of a rodent problem is critical because these pests reproduce rapidly. If a rodent feels safe, warm and sheltered, it will start reproducing. Mice can produce eight litters every year, with four to seven pups in a litter; rats produce about six litters a year, each with eight to twelve pups. And with some rodents able to reproduce in as little as 35 days after birth, it doesn’t take long for an infestation to get out of control. Seal the exterior – Walk around the exterior of your facility and check for any holes or cracks the size of a dime or larger. 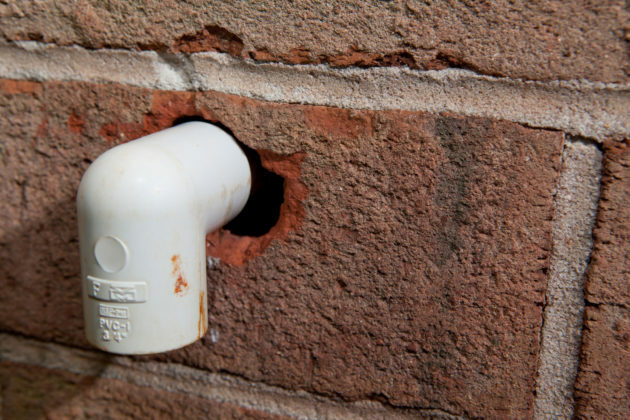 Pay close attention to pipes and other penetrations that have open spaces around their connection to the building. If cracks and holes are found, seal them with a water-resistant sealant and steel or copper mesh. Cover floor vents with mesh no more than 1mm thick. Pay attention what’s going in and out – Rodents can enter your facility on pallets, shipments of ingredients or through open doors. Use a UV black light to detect rodent urine, which could indicate infested skids or loads when received, and ensure doors remain closed whenever possible. Double-doors at frequently used entrances can make it more difficult for rodents to sneak inside. Remove clutter – Rodents use a variety of materials to build their nests, so areas fraught with clutter will look appealing to them, especially if they are littered with materials like cardboard boxes, and paper. Store food products securely – Keep all food products tightly sealed and off the floor, as rodents have an easier time detecting and getting into food if it isn’t elevated. Also, containers made of plastic or metal can help prevent rodents from chewing through. Eliminate standing water – Frequently monitor machines that might leak or perspire, and work with maintenance personnel to make repairs if necessary. Also, remove any standing water around the exterior of the building. Don’t let plows pile snow and ice next to your building. Use game or trail cameras – If you’re not sure where the rodents are entering the building, installing cameras might help pinpoint hidden rodent entry points and overlooked crevices. Video footage will help you monitor activity overnight when rodents are most active. Remember, rodents are highly instinctive, adaptable and difficult to eliminate once they’ve made themselves at home. If you’re worried that your facility might be at risk of a rodent infestation, contact your pest management provider for a thorough assessment.